Unlike past, now a days people with alarming levels of obesity and poor control of type 2 diabetes face have a new option for bariatric surgery in addition to intensive lifestyle management to improve their health.In a randomized controlled clinical trial, scientists from Joslin Diabetes Center and Brigham and Women’s Hospital compared the results of bariatric surgery with intensive lifestyle management in severe obesity and uncontrolled type 2 diabetes.The researchers found that Gastric bypass surgery can give better control for diabetes and obesity than lifestyle modification and there was a significant weight loss, better diabetes management and improved quality of life with bariatric surgery. The paper provided the latest results from the SLIMM-T2D (Surgery or Lifestyle with Intensive Medical Management in the Treatment of Type 2 Diabetes) study, which randomly allocated 38 obese patients with type 2 diabetes to treatment either by surgery at BWH or through Joslin’s Why WAIT intensive lifestyle management program. These participants had an average weight of 230 pounds and body mass index (BMI) of 36.3. After three years, patients given surgery saw dramatically greater weight loss, averaging 55 pounds compared to 11 pounds for those in the lifestyle management intervention. The surgical cohort also lowered their hemoglobin A1c levels (a measure of blood sugar over several months) by an average of 1.79% compared to 0.39% for the lifestyle management cohort. Additionally, those given surgeries showed significantly lower risk of coronary heart disease and stroke. The two groups of trial participants generally self-reported similar improvements in quality of life overall and less distress in living with diabetes–important positive outcomes. Those given surgeries did see a significantly higher impact of weight loss on their quality of life, and greater improvement in the domains of physical functioning, self-esteem, and work performance. 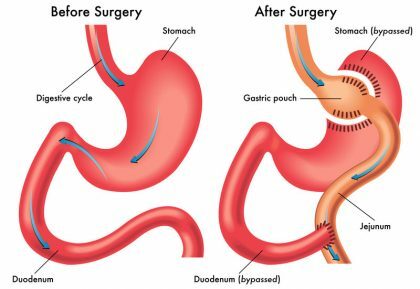 “As a result of these findings, we expect that more physicians will consider gastric bypass surgery as a viable option for patients with type 2 diabetes and mild tomoderate obesity when previous attempts to lose weight and improve glycemic control have not been successful,” said Simonson. Joslin’s 12-week Why WAIT intensive lifestyle management program includes a change in diabetes medications to enhance weight reduction, structured dietary intervention with lower carbohydrates and higher protein and meal replacement, an exercise program with emphasis on strength training, and weekly educational and support sessions.